UNESCO seeks to build peace through international cooperation in education, science and culture. Its mandate is as relevant as ever. Cultural diversity is under attack and new forms of intolerance, rejection of scientific facts and threats to freedom of expression challenge peace and human rights. Goal 16 on the Agenda 2030 states: “Promote peaceful and inclusive societies for sustainable development, provide access to justice for all and build effective, accountable and inclusive institutions at all levels.”. And the main goal of the New Urban Agenda is: “Leave No One Behind.”. Today we recognize there is much work to do around the world to fully realize peaceful cities and societies and to leave no one behind. Therefore in response, UNESCO’s duty remains to reaffirm the humanist missions of education, science and culture, and we encourage our colleagues in New Zealand to recognize that they are not alone in this struggle. The UNESCO Creative Cities Network (UCCN) is a project of UNESCO launched in 2004 to promote cooperation among cities which recognized creativity as a major factor in their urban development. The network currently comprises 180 cities from 72 countries. The network aims to foster mutual international cooperation with and between member cities committed to invest in creativity as a driver for sustainable urban development, social inclusion and cultural vibrancy. The Network recognizes the following creative fields: Crafts & Folk Arts, Media Arts, Film, Design, Gastronomy, Literature and Music. Apply Now for a Residency in a City of Literature! Dust off your resumes and polish your writing samples! Three Cities of Literature currently are accepting applications for their residency programs. Which one will you apply for? 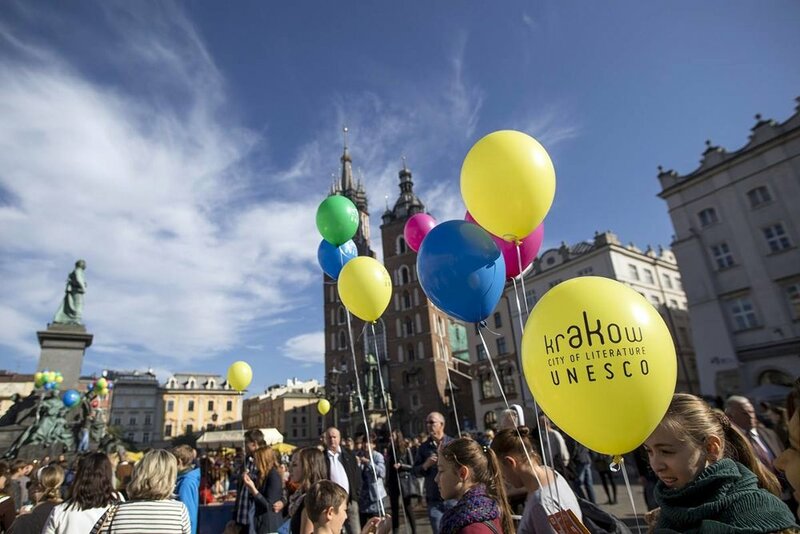 The Krakow UNESCO City of Literature Residency Program is dedicated to emerging writers from the Cities of Literature of the UNESCO Creative Cities Network. It aims to promote the Cities of Literature Network, provide writers with a platform to showcase their work and talent to a Central European audience, support greater diversity of voices and literatures on the Polish and Central European book market and offer local writers the chance to create links with international writers as well. The call for applications for 2019 is now open. Deadline for application submission is February 25, 2019. Tartu City of Literature Office announces the first 2019 call for applications of Tartu City of Literature International Residency Program for writers and translators. The call for applications is now open. The residency period is April-May 2019. Deadline for application submission is February 25th 2019. October 1-31 2019 and November 20–20 December 2019 (one month per residency/applicant). Deadline for application submission is March 31, 2019. Apply Now to Be Seattle's Next Civic Poet! Are you our next Civic Poet? 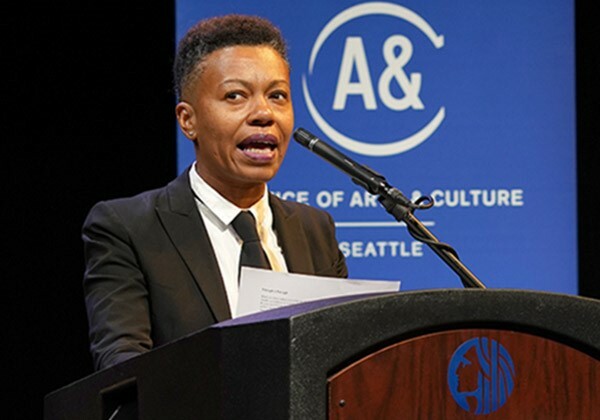 The Seattle Office of Arts & Culture and the City of Literature support an experienced poet with a two-year City residency as literary ambassador. In addition to annual City events, the Civic Poet will foster community dialogue and engagement between the City, the public and other artists while celebrating the literary arts. Saturday, February 16, 2 - 3:30 p.m. Learn what makes a strong application. The session will cover specifics on eligibility, and how to apply. All applicants are encouraged to attend. Seattle City of Literature has some exciting news. Having administered the UNESCO Creative City designation since late 2017, the nonprofit organization Seattle City of Literature is now entering into a limited agreement with the Office of Arts & Culture, the Seattle Public Library, and the Seattle Public Library Foundation. This agreement represents even greater municipal buy-in to our efforts and shifts the Creative City designation under the aegis of The Seattle Public Library for a period of two years. During this time, the role of the Seattle City of Literature nonprofit organization will be to advise programmatic decision making and to raise funds to help support program initiatives. We’re so excited that the City of Seattle is investing in the Creative Cities Network in this way, truly showing that the designation of City of Literature belongs to the entire municipality. And we’re looking forward to working closely with all of these organizations to support City of Literature programming going forward! Happy UNESCO Birthday to Us! It’s been one year since Seattle was designated a UNESCO City of Literature. And what a year! Since our designation, Seattle attended the Cities of Literature Subnetwork meeting in Iowa City (April 2018) and the Creative Cities Network meeting in Kraków (June 2018). In Iowa City, 26 of the 28 Cities of Lit attended. Seattle was welcomed into the network with 7 other new cities. We spent time getting to know the delegates and also how the subnetwork functions. In Kraków, 180 cities across all 7 disciplines attended. Our time was divided into a literary study trip and the UNESCO conference. Seattle also had the opportunity to meet with delegates from the other U.S. Creative Cities. The literary study trip introduced delegates to the breadth of the literary community in Kraków, and included meetings with publishers as well as the Polish Book Institute; visits to area bookstores; visits to cultural nonprofits; and attendance at the OffMiłosz Festival and the Szymborska Awards. The theme of this year’s conference was “Creative Crossroads,” and it focused on the idea of connection and intersection. The purpose was to “strengthen ties between cities from around the world” and to “serve as a platform to define the strategic objectives of the network,” centered around UNESCO’s Agenda 2030 and the Sustainable Development Goals. The 17 Sustainable Development Goals are targets for the Creative Cities to strive toward as we undertake our individual and collaborative work. Seattle presented to our literature subnetwork on our Equity Trainings, and presented as part of the full conference on a “Creative Mobilities” panel on transportation—showcasing Seattle’s Poetry on Buses. Seattle City of Lit has hosted four equity trainings for members of the literary community. These trainings have focused on cultural competency, implicit bias, unpacking privilege and hiring & retaining a diverse workforce. We have some funding to continue hosting these trainings. We partnered with our sister city Christchurch on an indigenous writers’ exchange. In 2016, Elissa Washuta traveled to Christchurch and took part in the WORD Christchurch Literary Festival. In 2017 Maori writer Nic Low traveled here and participated in LitCrawl Seattle. We also conducted a literary journal exchange where a journal from each city featured writers from the partner city to coincide with the writer’s visit. We have had ongoing partnerships with Reykjavik City of Lit, Iceland Naturally, and their “Taste of Iceland” festival. This has included a program with saga experts and a band at KEXP (2016) and a recent visit from Reykjavik writer and environmental activist Andri Snaer Magnason. Since Seattle originally started the designation process, UNESCO’s focus has shifted to concentrate on ways that the network can help build sustainable cities through the arts. The 17 Sustainable Development Goals exist to help guide the overarching work that the network undertakes and give us a framework for how the arts sectors can help create more livable cities. We’re excited about how this work can create real impact in our city and in cities around the world. The Creative Cities Network, which Seattle is now a part of, is an amazing resource for inspiration, collaboration and best practices. And the best news? 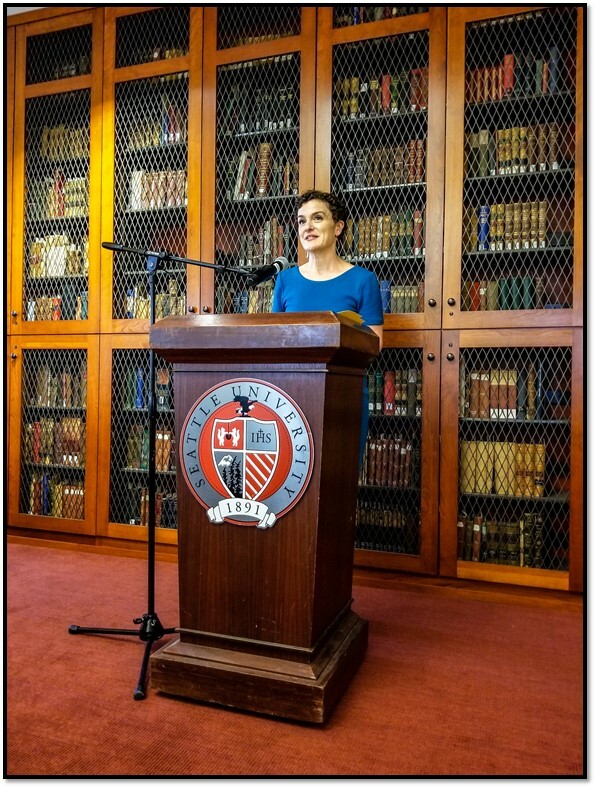 Over the summer, Seattle University hosted participants from the Study of the U.S. Institute (SUSI) for Scholars on Contemporary American Literature. The director of the program, Charles M. Tung, invited Stesha Brandon, Board President at Seattle City of Literature, to address the participants at their closing event. The Institute hosted eighteen scholars and educators—from eighteen different countries—who visited the United States for four weeks of academic residency at Seattle University, and two weeks of a study tour to San Francisco, Berkeley, Los Angeles, and Washington DC. This year's participants were from Algeria, Brazil, Cameroon, Chile, Cote d'Ivoire, India, Indonesia, Israel, Mongolia, Nepal, Pakistan, Slovak Republic, Suriname, Thailand, Togo, Tunisia, Turkey, and Ukraine. This Fulbright-related program is funded by the Bureau of Educational and Cultural Affairs at the Department of State. SUSI's goals include more diverse and complex understandings of U.S. literature and culture, an enhanced set of pedagogies for teaching such complexity, stronger research and curriculum development in participants’ home countries, and the possibility of further opportunities for meaningful exchange of ideas and experiences. "As you all well know, literature can act as a window. And it can act as a mirror. It can reflect our experiences or introduce us to new ones. It allows us to build empathy and understanding; to pay witness; and to grapple with difficult concepts and emotions. You come to this conference at a time when our country and our community is exploring and redefining what it means to be American, what it means to have literature of, and for the United States. While Seattle, as a UNESCO City of Literature continues to be dedicated to upholding the ideals that UNESCO stands for, it’s clear that America is currently grappling with difficult concepts. We’re asking: what is true? And who gets to define the narrative? And how can we build empathy if we’re building walls?" Learn more about SUSI and the 2018 program here. Seattle was designated a UNESCO City of Literature and it's time to celebrate! Join us for a public celebration on Tuesday, May 22, 2018 at 7pm at The Seattle Public Library. The party will take place at the Central Library, in the Reading Room on the Tenth Floor. The United Nations Education, Scientific and Cultural Organization (UNESCO) announced it designated Seattle as a City of Literature in the Creative Cities Network. Seattle joins an international network of 116 member cities from 54 countries that promote socio-economic and cultural tourism in the developed and developing world through creative industries. The bid to join the Creative Cities Network was led by Seattle City of Literature, a non-profit whose aim is to foster public and private literary partnerships in the city and abroad to promote a robust creative economy. Seattle is the top city in the United States for arts organizations per capita, and our nonprofit arts landscape is the fourth largest in the USA. The 325 nonprofit arts organizations in the greater Seattle area generated more than $207 million in revenues in 2012, according to the Seattle Office of Arts& Culture’s Creative Vitality Index (CVI) report, which tracks economic health and development in arts and culture. Employment in arts and culture in the Seattle metro area increased by more than 6 percent from 2010 to 2012, and as of 2012, nearly 31,000 people—or 3.5 percent of the population—worked in the sector. Over the last five years, of their $10 million annual budget, the Office of Arts and Culture has dedicated an average of more than $230,000 in funding to literary and storytelling programs and artists—meaning they have invested more than $1.2 million in literature in the last five years. Additionally, according to data provided by 4Culture, the King County cultural funding arm, the county has granted more than $2.5 million to literary programs and individual writers in the last five years, from historic renovation funds to individual artist grants. “Seattle has a wonderfully rich literary history beginning with the storytelling tradition of Native Americans in this region,” said Bob Redmond, Board President of Seattle City of Literature. “We found widespread support in the community for this successful effort. We look forward to working with partners in the arts community to participate in this global network." The non-profit worked with the City of Seattle to establish a Civic Poet program. Claudia Castro Luna, Seattle's first Civic Poet, served as an ambassador for Seattle’s rich literary landscape and represents the city’s diverse cultural community. In addition, Seattle City of Literature has collaborated on events with Hugo House and Elliott Bay Bookstore, and arranged for artist exchanges between Seattle, New Zealand and Iceland. This month, Seattle City of Literature hosted the second half of its Indigenous Writers Exchange with Nic Low of the Ngāi Tahu tribe of New Zealand. Last year, Elissa Washuta of the Cowlitz Tribe traveled to Christchurch for a similar exchange. Seattle’s literary resources include thriving independent bookstores, public libraries, literary arts nonprofits and writing programs that serve diverse communities, publishers and small presses, professional organizations, readers, and writers. Seattle City of Literature aims to foster a culture where local writers can stay on the West Coast and be supported by local publishing amenities. The board and stakeholders who generously gave their time and resources to develop the bid to join the Creative Cities Network includes writers, readers, editors, publishers, teachers, and non-profit leaders. Seattle joins a group of 20 outstanding UNESCO City of Literature members including Iowa City (the first US city to gain recognition); as well as Edinburgh Scotland, Krakow, Poland; Baghdad, Iraq; Dublin, Ireland; Montevideo, Uruguay; and others. by Elissa Washuta Q: You were in New Zealand? How was it? A: Great. / Amazing. / Exceptional. / It changed my life. Q: Vacation? Or like a book thing? A: Officially, the WORD Christchurch Writers & Readers Festival, to which I was invited as a panelist, workshop co-leader, and reader. Unofficially, it was, in a way, a vacation, or the closest thing I’ll get to taking a vacation in New Zealand in the foreseeable future (starving artist, workaholic, unable to relax and suspend productivity, et cetera). The question makes me realize that I may not even know what a vacation is, so I looked up the word in the dictionary. An extended period of recreation, especially one spent away from home or in traveling. Or: The action of leaving something one previously occupied. The second fits. When I stepped into the Auckland airport before dawn after twelve hours on an airplane maybe eight times the size of my apartment, I began to cry. I felt the enormity of this gift, and I felt some hard block of pain dislodged by the knowledge that my body had just traveled to the other side of the world. I can’t talk about this trip without mentioning that I had been heartbroken for weeks when I made the trip. I tucked my wounded heart into a winter jacket and took it to a place it had never seen. After a few minutes of dreamlike wandering through the Auckland airport, I realized I didn’t have much time to get onto my connection to Christchurch. I rushed through immigration and biosecurity and, on the other side, headed for the next terminal, I found myself in the middle of a group of people in pristine black tracksuits with the Olympic rings emblazoned on their luggage. Together, we stepped into the public meeting area, and the people gathered there cheered, and I let myself absorb stray beams of their love. And then I stepped into the late-winter dawn, waiting for the bus, looking at trees I didn’t recognize, and my whole body knew that it was making itself new. Q: Sounds like a great opportunity. How’d you make that happen? A: I don’t make anything happen—anything that works out well, anyway. Q: So what kind of stuff did they have you doing? A: It’s impossible for me to fit all of it in a blog post, but I’ll attempt highlights. I co-lead a workshop for Ngāi Tahu writers with Ali Cobby Eckermann, Hana O’Regan, and Ivan Coyote, where we maintained a space in which we could freely talk about writing and Indigeneity. With the other international writers, I traveled to Tuahiwi Marae to participate in a pōwhiri, a Māori welcome, where I was able to introduce myself and my family and share a song and a story. I participated in a powerful Sister Cities/First Nations panel with Ali and wonderful moderator Nic Low (great write-up here), which unexpectedly turned into a magical discussion about anger, violation, self-destruction, and healing. Every day, I had a lovely, celiac-friendly breakfast at the bed & breakfast. I met writers who became family for a few days and shared special meals with good people. New friends showed me around town, walked with me, department store shopped with me, went to panels with me (and came to mine), and raved, in detail, about the plot of Philip Pullman’s Northern Lights (stopping at spoilers). Q: Is it as beautiful as they say? A: Yes, but not in the way they say. Not like Lord of the Rings—not Christchurch, a city leveled, loved, and rebuilt. Exquisite street art is everywhere. The tenderness for beloved buildings is evident in their reconstruction. And the people—their warmth is the most beautiful thing about Christchurch. Q: It must have been a good time for you to get away, right? I mean, how are you feeling? Better? A: Better, yes. In Seattle, I’ve learned over and over that it’s easy to infuse a place with hurt. Before I moved here, I listened over and over to my favorite Pearl Jam song, “All Those Yesterdays,” and tucked one of the lines into myself: “It’s no crime to escape.” It makes sense that I would need to board a plane, fall into slumber, and wake up in a new place, a new season, smelling winter, as though I’d performed the tesseract I always hoped I would when I read A Wrinkle in Time as a kid. I traveled through space and time the short way, and even disoriented and dislocated, I had everything I needed the whole time. Seattle City of Literature and the Office of Arts and Culture are pleased to present the final workshop in the series on ‘Racial Equity and the Literary Arts.' Working with facilitator, Dr. Caprice Hollins, this program will focus on understanding racial privilege. Using lecture, discussion, and experiential exercises, participants will deepen their understanding of self and the concept of privilege. We will then discuss common ways that privilege manifests itself on an institutional and personal level, and how it influences relationships within and across cultures. The workshop will take place on Tuesday, October 18 from 1:30pm to 5:00pm at the Bertha Knight Landes Room at Seattle’s City Hall. There is no cost to attend, but space is limited, so please email rsvp@seattlecityoflit dot org to reserve your spot by October 14. About the facilitator: Dr. Caprice Hollins, co-founder of Cultures Connecting, LLC, received her doctorate degree in Clinical Psychology with an emphasis in Multicultural and Community Psychology in 1998. She became licensed in Washington State in 2000 and has over 20 years of experience teaching graduate courses, working with historically marginalized populations, researching, studying, and facilitating race related conversations. Her experience includes opening and directing the Department of Equity & Race Relations for Seattle Public Schools, developing and implementing district-wide and school-based training, while utilizing her background in psychology to assist district leaders and staff institutionalize change to promote equity and social justice. Dr. Hollins also works as a part-time core faculty in the department of counseling at The Seattle School of Theology & Psychology. by Elissa Washuta People have been asking me whether I’m excited to visit New Zealand, and the answer is yes. People want to know what I’m going to do there. My answer is brief: I’m going to lead a workshop for Ngāi Tahu writers, present a PechaKucha, and participate in an Indigenous writers panel. Yes, but—New Zealand. I know. I’ve been out of the country fewer than five times, I think, for trips to Canada. I’ve thought I should travel more after I made an OKCupid profile and quickly began to sense, from the Machu Picchu photos and lists of passport stamps collected, that my lack of worldiness should be a secret. I grew up in New Jersey, sort of in the woods, a few miles away from a sod farming hotbed, and in those lakes and trees and people, I had a world. I have been asked to write about my anticipation for this visit, but I’ve procrastinated, because when I think about my expectations and excitement for this visit, I visualize no landscapes, no scenes. I looked up Christchurch online, but was overwhelmed by the idea of planning for the trip, so I have only a single image of a street scene in my head from a tourism website that I didn’t explore. My life is spent imagining every possible thing that could happen to me, a process that makes up the gnarled nest of fear and hope in which I live, but this trip to New Zealand is one thing that’s going to happen to me that I can’t picture. I see my own country through the trips I make as a working writer. I spend time teaching in Santa Fe every year. I travel around the country for readings. This is how I spend my summer vacation: spread throughout the year, in patches and pieces, working. This is my comfort zone. I don’t think I could take a vacation without a tutorial. With my trip just weeks away, I went back to the Christchurch tourism website. Reading about tours, museums, and parks, I realized that I draw only mental blanks when I think of places. When I think of New Zealand, I think of people. In 2013, I told Ronnie I wanted to visit Aotearoa—and, really, it was the first place outside North America I’d given serious thought to visiting. This desire to travel, for the first time, was infused with purpose and thoughts of making relationships. When I wrote a letter of support for Seattle’s bid to be a UNESCO City of Literature, I thought of the Māori visitors to UW, the group of Native UW students who spent a quarter in Iceland, and my colleagues connecting with Indigenous scholars around the world. I expressed my hope that the City of Literature could provide opportunities for the Native writers from Coast Salish territory to collaborate with other Indigenous peoples. To be the first Seattle writer to participate in the programming I imagined for the City of Literature is a tremendous honor. I suspect that my imagination’s blank spot has to do with something that’s become commonplace in my brain lately as I take on projects that scare me in their thrilling enormity: My excitement is mixed with the sobering knowledge that I have a responsibility. I will make new relationships, represent my family and community, and learn from the people I’ll meet in Ōtautahi. I’ll come home with mental pictures of lands where, like here, people have created place by making and maintaining relationships with their environments over innumerable generations. (Seattle—June 23, 2016) Seattle City of Literature is pleased to announce that local writer Elissa Washuta will present a workshop and participate in a panel featuring indigenous writers at the WORD Christchurch Writers & Readers Festival in Christchurch, New Zealand. In addition to Washuta’s participation in the festival, Seattle poets Maged Zaher, Claudia Castro Luna, John Olson and Angel Gardner will have their work featured in the New Zealand literary arts journal Catalyst in connection with the festival. Washuta, a Seattle-based memoirist and essayist, will run a non-fiction workshop for Māori writers in conjunction with Christchurch’s Ngāi Tahu tribe, and participate in a ‘Sister Cities/First Nations’ panel with a Māori writer from Christchurch, Nic Low, and an Aboriginal writer from Adelaide, Ali Cobby Eckermann. WORD Christchurch presents a variety of literary events, including a biennial Writers & Readers Festival – the largest literary event in New Zealand’s South Island. The events bring writers, thinkers and performers together to celebrate the written word and provide a window for readers to respond to ideas. Washuta is a member of the Cowlitz Indian Tribe and the author of two books, Starvation Mode and My Body Is a Book of Rules, named a finalist for the Washington State Book Award. Her work has appeared in Salon, The Chronicle of Higher Education, and BuzzFeed. She holds a Master’s in Fine Arts from The University of Washington and serves as undergraduate adviser for the Department of American Indian Studies at the University of Washington and is a nonfiction faculty member in the MFA program at the Institute of American Indian Arts. She is a faculty advisor for Mud City Journal and Saturday editor for The Rumpus. Washuta’s visit is supported by the Christchurch City Council Sister City Programme, which is supporting the attendance of an indigenous writer from both Seattle and Adelaide, two of its Sister Cities. Seattle City of Literature and the Office of Arts and Culture are pleased to present the first in a series of workshops on ‘Racial Equity and the Literary Arts.’ Working with facilitator, Dr. Caprice Hollins, this program will provide a framework on how to address issues of equity and race in our community, and help to create a common language for entering into discourse. Participants will begin to appreciate their role in becoming culturally competent by deepening their awareness of self--moving from color blindness to racial cognizance; increasing their knowledge of others and their experiences of racism and oppression; developing skills to work effectively across cultures; and advocating and taking action to initiate change. The first workshop will take place on Thursday, June 2 from 1:30pm to 5:00pm at the Bertha Knight Landes Room at Seattle’s City Hall. There is no cost to attend, but space is limited, so please email rsvp@seattlecityoflit to reserve your spot by May 31. After the initial workshop, Seattle City of Literature will convene an advisory committee from the community to help shape our goals for the remaining workshops. If you are not able to attend the first workshop but are interested in hearing about subsequent meetings, or participating in the advisory committee, let us know! Email Stesha Brandon [executive@seattlecityoflit.org] for more information. Dr. Caprice Hollins, co-founder of Cultures Connecting, LLC, received her doctorate degree in Clinical Psychology with an emphasis in Multicultural and Community Psychology in 1998. She became licensed in Washington State in 2000 and has over 20 years of experience teaching graduate courses, working with historically marginalized populations, researching, studying, and facilitating race related conversations. Her experience includes opening and directing the Department of Equity & Race Relations for Seattle Public Schools, developing and implementing district-wide and school-based training, while utilizing her background in psychology to assist district leaders and staff institutionalize change to promote equity and social justice. Dr. Hollins also works as a part-time core faculty in the department of counseling at The Seattle School of Theology & Psychology. Today UNESCO's Creative Cities Network announced designations for cities in seven disciplines. We were sorry to learn that Seattle, which had bid for City of Literature status, was not one of them. We offer enthusiastic congratulations to our fellow US cities who did win designation: Detroit (Design), Tucson (Gastronomy) and Austin (Media Arts). Also, big kudos to the nine cities internationally who won designation as Cities of Literature: Baghdad (Iraq), Barcelona (Spain), Ljubljana (Slovenia), Lviv (Ukraine), Montevideo (Uruguay), Nottingham (UK), Óbidos (Portugal), Tartu (Estonia), Ulyanovsk (Russian Federation). We deeply thank Seattle Mayor Ed Murray, his staff at the Office of Arts & Culture (particularly Randy Engstrom and Calandra Childers), City Councilmember Nick Licata, Rebecca Brinbury, Barbara Malone and all our stakeholders who were generous with resources, time and input as we developed the 2015 bid. We also want to thank our many supporters nationally, especially State Department staff and Iowa City's City of Literature staff, and our endorsers at the American Library Association, Association of Writers and Writing Programs, and PEN America. The widespread support in the national and local arts community for this effort is evident as it is inspiring. We are assessing potential support for another bid and how to move forward best to support the literary arts community in Seattle and regionally. Our non-profit has made progress in galvanizing local literary support for the effort and in establishing connections with literary cities around the world. Among our successes this year is our work with the City of Seattle to establish a Civic Poet program. Claudia Castro Luna, the city’s first Civic Poet, serves as an ambassador for Seattle’s rich literary landscape and represents the city’s diverse cultural community. In addition, our organization collaborated on events with Hugo House and Elliott Bay Bookstore that focused on diverse international voices. We will be in conversation with our local literary and arts stakeholders to develop a path forward, and will share news when those next steps are clear. If you want to be part of that conversation, please contact us! Greetings, Seattle readers and writers! We had a heck of a busy summer and wanted to update you all on where our bid to join the UNESCO Creative Cities Network stands, among other things! We submitted our UNESCO bid in July and celebrated with a small toast the Sorrento Hotel, which has been generous in hosting us. UNESCO committees will discuss the bids and make decisions. We will find out if we received the designation before the end of 2015. We also also finished a short video about Seattle's literary community. The video features Seattle Mayor Ed Murray, Ruth Dickey, Chris Higashi, Gary Luke, Rick Simonson, Garth Stein, Ken Workman, Tree Swenson, and Eric Reynolds. We brought in some money! Our board continued efforts to fund our initial program, the International Writers Exchange, working closely with the office of Nick Licata, various staff at the City of Seattle and the Office of Arts and Culture. The Office of Arts & Culture accepted our proposal and contributed $7500 in additional funding for this program (thanks OAC!). And there's more money! Every board member has made a financial contribution. Between those, other community contributions, and additional pledges, we've raised nearly $14,000 towards the organization's overall programs and operations. We compiled an Inventory of Literary Elements thanks to our Advisory Board, which has been generous with ideas and resources. We brainstormed a list of elements in the local literary ecosystem. We expanded this (ongoing) list, which you can find online here. Feel free to send us additional ideas! We are planting seeds for a future board. We would love to see a diverse and representative Board of Directors, and we have developed a board recruitment committee. In the past few weeks we confirmed members to this committee, whose formal meetings are being scheduled now. We made poetry a priority. We were deeply involved in the design of the Civic Poet program, worked on it this summer, and are thrilled to welcome Claudia Castro Luna, for whom we co-sponsored a reception at the Sorrento Hotel in September. Luna will be involved in City of Lit programming via the Writers' Exchange and other programs. We've been partying! We have officially co-sponsored two events this fall, one at Hugo House featuring readers from the Iowa International Writers Program: Sara Baume (Ireland), Margarita Mateo Palmer (Cuba), Homeira Qaderi (Afghanistan), and Antônio Xerxenesky (Brazil). Wow! On Friday October 9 we're headed north of Iowa with Taste of Iceland at Elliott Bay Book Company: Eliza Reid, co-founder of the Iceland Writers Retreat, in conversation with Tree Swenson of Hugo House. They will discuss Iceland's special inspiration for writers, gender equality, and Cities of Literature (Reykjavík is one!). The event is followed by Nigeria's Chinelo Okparanta with Seattle poet Montreux Rotholtz, presented by EBBC and Hedgebrook. Amazing evening! What to do now? While our bid is pending, talk to us and about us and with us on social media! Send happy vibes for our bid to join UNESCO! Tweet or Facebook at us with interesting literary material that brings you joy or makes you think! You can find us on Facebook here and on Twitter here. A happy, bountiful autumn to you all! Follow Seattle City of Literature on social media! Seattle City of Literature is on social media! Follow us on Facebook and Twitter to read the latest about our UNESCO bid. In addition, this summer our board members will post their favorite literary gems to our social media channels for your reading pleasure.